Hot Diggity Dodger Dog! Vin Scully will be back for another season of Dodgers baseball. Who would have thought that on this day in 1939	Major League Baseball would begin a television broadcast test by airing a double header between the Reds and Dodgers at Ebbet’s Field that it would affect millions of lives every summer? 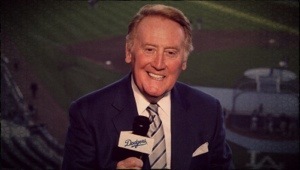 Peace isn’t restored in the universe from the end of the Super Bowl until Vin’s velvet voice rallies,”It’s time for Dodger baseball!” as he has for over 60 years. Even fans of other teams forget they don’t like the Dodgers while under Vin’s loquacious spell. Glad we have something to look forward to next season in case the Mayan’s are totally wrong.